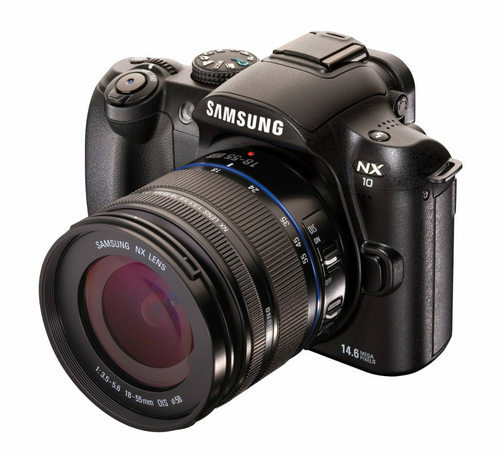 We were very impressed by the Samsung NX10. This is an awesome EVIL camera that is sure to please most any user, with excellent image quality, fast performance, and loads of useful exposure options. Read more in our Full Conclusion. The first real camera to compete with the Olympus and Panasonic micro four thirds models, Samsung's NX10 is a powerful "EVIL" (Electronic Viewfinder Interchangeable Lens) camera that packs a 14.6-Megapixel APS-C sized CMOS image sensor, which is same size unit found on most dSLRs on the market. This means the NX10 should offer superior low-light capabilities when compared to cameras with smaller sensors that offer the same resolution. This unit also utilizes dust protection using super sonic vibrations at 60,000 times a second to keep the sensor clean between lens changes. Being an EVIL camera, you can frame your shots on either the high-quality EVF or the gorgeous 3.0-inch AMOLED display. This AMOLED screen has a response rate 3,000 times faster than your typical LCD and a 10,000:1 dynamic contrast ratio which should translate into clear images ant any angle and great color representation. The camera comes packaged with their 18-55mm F3.5-5.6 OIS lens, but other lenses are available; we were fortunate enough to test the NX10 with their 30mm F2.0 pancake style lens, and the 50-200mm F4.0-5.6 OIS zoom lens. Samsung claims they have taken the frustration of complicated menus and settings out of the NX10 with their new Easy User Interface and have also made managing your photos in-camera easier with the Smart Album feature. Here you can categorize pictures by date, faces, favorites, content, etc.. The base price for the camera and 18-55mm zoom lens kit is $649.00 US; and like Henry Ford said of his Model T, "You can have any color you want as long as its black."